As you could probably already tell, I love making people happy with food. It's one of my greatest qualities, in fact. (Is that a "braggy" thing to say? Hm, oh well.) Whenever I plan to go somewhere, I think my initial thought always happens to be, "What could I bring for everyone to eat?" Nothing changed this morning when I knew I was headed to Bucky's semifinal playoff football game for his U14 team. "Sandwiches, of course," I thought, "everyone loves sandwiches!" And really, how could you not love these next two recipes?! Read on to find out! 1. Start by slicing your ciabatta loaf lengthwise. Spread each half with the butter, and sprinkle with parsley and garlic powder. Bake cut-side up in a 350-degree oven for 15 minutes. 2. In a large skillet, saute the garlic and olive oil and drop in the broccoli rabe. Saute on medium-low heat for 25-30 minutes, until broccoli rabe is wilted completely and it is the to consistency you like. I like it very soft, some people like it with a bite. Remove from pan and set aside. 3. Liberally season your chicken cutlets with salt, pepper, and paprika. Transfer to the same hot pan you used to cook the broccoli rabe, and sear your chicken until cooked through. 4. Remove your bread from the oven and begin to build. 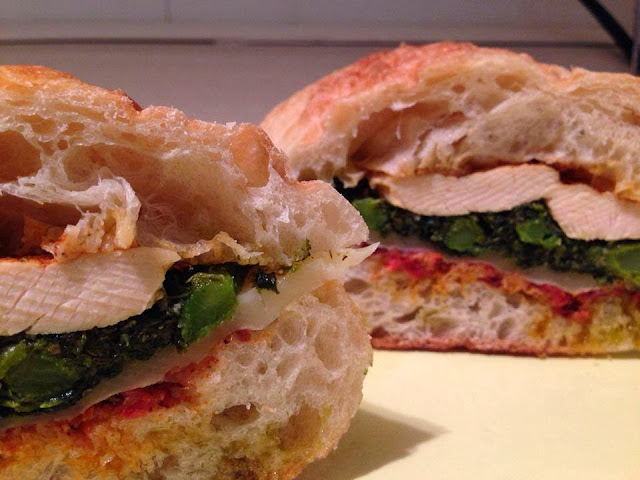 Lay your sliced provolone on the bottom, followed by the sauteed broccoli rabe, and then chicken. 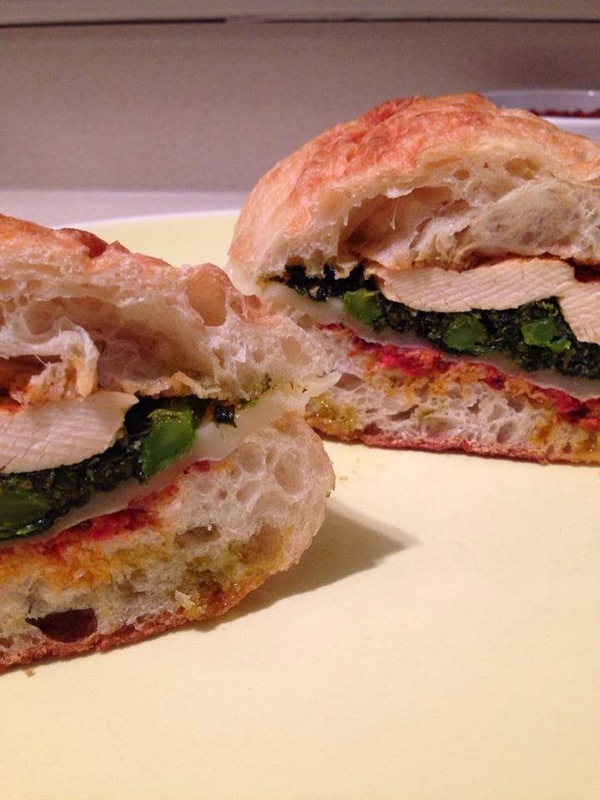 Top with the "lid" of the ciabatta, and wrap in foil. Return to oven for 10 minutes, until cheese has melted and all the flavors meld together. Remove from oven, slice (while still in foil, making it easier to keep the sandwich held together), and enjoy!